Fun ideas for a Spa Themed Birthday Party. Mix and match these ideas to create your own special party for kids, pre-teens and teenagers. 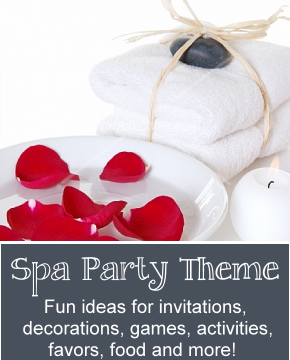 We've gathered great ideas for spa party invitations, decorations, games, activities, food and more! Spa Party - a Sparty! - complete with free homemade Spa Recipes! Our favorite free homemade spa party recipes. Facials, masks, scrubs, bath salts ... even a chocolate facial mask recipe and lots of other fun kids spa party ideas. All made from easy to find ingredients! Write party information on flip-flops that they can wear to the party. Or attach party information to new slippers or head bands they can bring to the spa party. Print party information on address labels and attach to bottles of lotion. Write party information on sleep masks and send to guests. Ask guests to bring robes and slippers ... or arrive in their pajamas to the Spa Party. Hang sheets around the spa room to give a dreamy feeling. Set candles on the tables and use white Christmas style lights hung around the room and on tables. Chinese lanterns are always a fun and colorful decoration. Set up several tables with a few chairs around each one and make spa stations. Have a station for skin, hair, makeup pedicures and manicures. Let the girls rotate through the stations changing every 15 minutes. Ask friends or family members to help with the stations. A local hair stylist may be willing to come in for an hour to do “up-do’s” on the girls hair for a small fee. Use a hairstyling computer program to show the girls what they would look like with different hairstyles. Also add a “waiting room” as one of the stations. Set up a comfortable area with couches, large chairs or pillows. Place trays of chocolate covered strawberries, chocolates, fruit kabobs, Rice Krispie treats cut into hearts or circles etc. around the waiting room with small plates so the girls can nibble while they are waiting. Also set out sparkling cider in champagne flutes for them to sip on. Place several colors of nail polish in the middle of a circle of girls. Have the first girl spin a bottle of nail polish. Who ever the cap of the nail polish bottle is pointing to when the bottle stops spinning takes the polish then paints one fingernail in that color. Then that person spins the next color of nail polish .... and so on. Include your toes also to make this game last twice as long. Take a truth question (you can print out our free questions and dares to make it easy) and then choose someone to ask the question to. If the one you ask the truth question to won't answer the truth then they choose a dare from the dare jar. We've made huge list of fun, free and clean truth and dares that are rate G. Free truth and dare questions. Activities Make homemade spa treatments either with the girls help or before the party and then use them at different stations. Check beforehand with parents to make sure there are no allergies with the ingredients you are using. Print out the recipes for the homemade spa products so each girl can take them home with her. Make satin sleeping masks to take home. Decorate with feathers, sequins and glitter. Ask guests on the invitation to bring their unwanted facemasks, lotions and nail polish. Have a spa trade and let the girls try new products. Trays of healthy snack foods - finger sandwiches, veggie tray with dips, whole grain crackers and cheese are all good choices. Chocolate fountain with fruit and marshmallows to dip. Small trays of petite fours or chocolates are a fun treat. Let the girls make fruit smoothies - then drink them out of champagne flutes. Flip flops, nail polish, lotions, small scented candles. Pretty jars to hold their homemade spa treatments with the recipes attached. Fingernail files, pretty combs, hair ribbons or barrettes. Fun satin sleeping eye masks. Recipe cards printed out of all the homemade spa recipes used at the Spa Party. Pretty basket to hold the party favors tied with a pink ribbon. Shower caddy plastic tote.